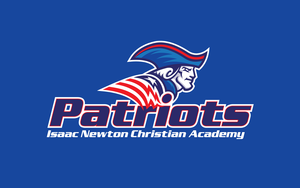 The staff and leadership of Isaac Newton Christian Academy desire that our athletic program be part of our efforts to stand out for Christ in all that we do. The challenge of our athletics program is to understand how God's Word applies to this area of life, and to learn how to apply the biblical principles in a practical, life-changing manner. We desire to train our students to think about winning from a focus on Christ. Winning is conducting oneself in the same way that Jesus did. Winning is striving with all of your heart, mind and strength to be Christ-like. Winning is playing to please an audience of one—Jesus Christ. The tradition the Academy is establishing is to glorify God by winning with honor and losing with grace. We desire to win, but only if in doing so, we honor God. Such a tradition is worthy of the best efforts of all concerned. A Sports Advisory Council meets periodically to help set athletic policies, to work with coaches, and to develop ideas to strengthen and promote our sports program. To provide a Christian environment for student athletes to develop their athletic talents. To instill in student athletes an attitude of respect and sportsmanship towards other players, coaches, officials, and fans that is consistent with Biblical principles. To provide a forum for student athletes to be a Christ-like witness to players and spectators as they compete against other teams. To provide an opportunity for student athletes to develop individual and team skills and strategies, as well as an understanding of different roles on a team. Becoming a member of an Isaac Newton Christian Academy athletic team is a privilege; one that should not be taken for granted. All student athletes learn to take responsibility for personal growth by developing loyalty, pride, integrity, and commitment. As a member of the Academy's athletic program, a student athlete is responsible to help build a tradition that is glorifying to God. When a student athlete wears the Patriot red, white, and blue, he or she is willing to accept the responsibilities that go with representing the school.